← That’s Real-Life Spirituality For Ya! Precious thoughts Jason. I love the “When I was little all I wanted to do was fight….” And so it is for all warriors who have learned to embrace and share compassion. It is a long, difficult, and wondrous journey. Thank you for sharing yours. 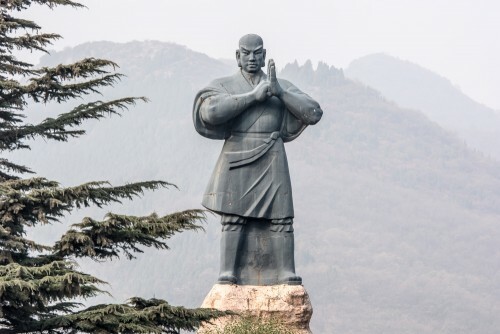 As I understand it Shaolin was already practicing Martial Arts before Bodhidharma arrived as had been the case through out China. Martial tradition was centered on the application of Yin, Yang and Jin in the context of the Confucian ethical socio-political framework of the time. As a definition and a truth Zen cannot really be said to have started at Shaolin, but what can be said is that when Awakening did occur the integration of practice cemented the link between peace and conflict dissolving them into a single state of experience. Martial tradition becomes Art only when the practitioner makes self-development and Awakening their goal. One cannot be a warrior and monk. He can only be himself. The soldier trains in many skills so that he can confidently adapt to life as it meets him. The Dojo allows a person to prepare for danger, the landscape tests the level of Mastery. Zen is not philosophy. Its feeling the fullness of life in context and discovering how we react to it. Today the rifle replaces the sword but the experience is unchanged. Can I serve those who wish to kill me, my family and my Nation? Am I filled with compassion for the mind who straps a bomb to a child and sends her to her death so that I come to harm? If I numb my Self to conflict or war where will I find peace? Without compassion how can anyone become Awakened. The quote could be changed for a man to “princes” to make it appropriate for yourself. I recall this quote being used in the TV series with Ron Perlman & LInda Hamilton of Beauty and the Beast and not given as from the source above, but from the novel, Great Expectations, but the quote was worded differently with the same meaning. Either way, it applies to your concept of all challenges are the adventures of life with a healing power we may not see at the beginning of that journey. Way to wake us up on a Sunday morning, Jason! I’ve been growing increasingly restless for several years on a number of fronts. An influential friend recently advised me to figure out what I want after listening to my travails, and I work on that every day. But I would substitute “needs” for “wants” in that piece of advice. After reading this post, I particularly like your point that “I couldn’t find peace; I had to learn instead to be at peace with what I found in me.” Seems very relevant to me at this juncture as that is something I need to do. Thanks. Agreed, Greg. Love the line “I couldn’t find peace; I had to learn instead to be at peace with what I found in me.” Seems that we are all searching externally for this peace, rather than internally. Thanks for the great writing, Jason. Jason, since a started getting your message by email, I’ve read every one thought it has not been easy. It is very difficult for me to read from a screen. I print everything I want to read that is more than a few sentences. With your messages I’ve tried every way I can to print them out but it has not gone well. I get multiple pages with the comments and the type is too light and small. Is there a way you can add a print feature? Oops, I actually do know that you have a print option. What I really need is a way to copy and print so I can adjust the type size and shade. Thanks. It is true, we are all warriors and monks. The perfect example in my life is being a parent. When I’m having bonding time with my kids having fun, and the hugs that I get from them, are all sides of the monk. But when they don’t do their chores, I have to be the warrior. Anyone who has been a parent knows we have to balance both when dealing with kids. One of the hardest things for me to do with them is to be the warrior. My one son was diagnosed with OCD (obsessive compulsive disorder). Our life was at a stand still where he was paralyzed with fear, unable to cope or deal with life. Through cognitive behaviour therapy we were able to get him the help he needed. But part of that help was for me to learn to be a warrior. If he was afraid of something, I had to force him to face his fears, which was so hard for me, because as a parent my instinct was to protect him from everything. Once he was facing his fear then the monk came out as I encouraged him to use the coping skills and tools he learned in order to deal with the situation. This was 9 years ago now, and today you wouldn’t even know he has OCD. Both the monk and the warrior are parts of me. Learning to balance and know when to use which is sometimes tricky, other times more natural. As I grow, I am learning to use both wisely. The authentic sharing of your journey is truly touching. You had the courage to be vulnerable, to share from your heart, the hurdles of your journey. You discovered your light and by doing so, as Marianne Williamson so brilliantly said:”And as we let our own light shine, we unconsciously give other people permission to do the same. Thank you for pointing out the benefits of having a balance between the ‘warrior’ self and the ‘monk’ self so we too can enter that sweet spot and allow both energies to guide us to higher grounds. Thanks for this article and for sharing some of your life with us. I am currently reading a book by Pema Chodron called “When Things Fall Apart” Pema is an American Buddhist Nun who is in my opinion a warrior, encouraging folks to lean into life, even the sharp edges of life and to face what scares you as wells as being compassionate towards yourself and others, to be okay with your whole self. I am find this message running through many books and talks that I have encountered over the last few years. I find that very encouraging. I ordered your book and look forward to reading and sharing it with others. Ha, I bet you mad a FEW saints mad along the way! I urge you to do a Kriya Yoga initiation and learn their meditation techniques. They call it the Rocketship, ya know. PS: Saints don’t get mad — that’s a litmus test on our journey. The people we piss off aren’t usually the teachers we were looking for. AS A FELLOW WARRIOR AND MONK, I SALUTE YOU AND YOUR QUEST. I have felt like that…..especially now. When I’m with my husband, niece and nephew….when I’m doing yoga or drinking my green juice….even reading….I feel all monk. When I’m at work….all warrior….guns blazing! !